Waveriding has most likely been a part of human culture ever since the earliest humans first watched dolphins surfing, jumping, and squealing with joy on their forays to the beach looking for food. I can imagine the first human tentatively venturing into the water and throwing his body into a wave, bodysurfing to the beach and jumping up after being tumbled with a loud, long “ahooooooo”, then running back into the surf for another. It seems that there has been evidence of surfing discovered in Peru that dates back even before the Hawaiian Islands were colonized by the Polynesians, more than 2000 years ago. Many Peruvians have long claimed that surfing began on Peru’s shores by pre-Columbian cultures. They were to have ridden reed boats called “Caballito de Totora’, and were constructed from a plant named Totora. These plants are a hollow type of reed and were used by pre-Inca civilizations. There has even been pottery more than 3000 years old found that clearly shows people waveriding! Theory has it that tribal fishermen began the habit of standing in their reed boats getting them in through the surf. Surfing was first described by Joseph Banks on the HMS Endeavour while on the first voyage of explorer Captain James Cook in 1769. In 1777, Captain Cook observed surfing islanders at Matavai Point in Tahiti and in 1778 while visiting the Sandwich Islands, today’s Hawaiian Islands. 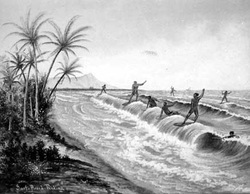 It seems that surfing was central to the ancient Polynesian culture. The most skilled “surfer” in the community was the chief, or Al’i and would have had the finest board, made from the best tree. The best beaches and the best boards were controlled by the Polynesian ruling class. Common folk were banned from these beaches but if they could demonstrate their prowess on a board, they could earn prestige and a place in the “selected” lineup. Amazing! It sounds like the locals beaches today! Over the years surfing was documented by visiting Europeans to places like Samoa, Tonga, and other Polynesian islands as an integral part of cultural tradition. Surfing was so much more than recreation to the ancient Hawaiians. It was woven into their culture as an art form. The Hawaiian name for it was he’e nalu, which means “wave sliding” in English. The ancient Hawaiians had an incredible connection with the ocean and would call upon gods to deliver surf. There were three types of trees that provided special wood to craft their boards. They were the koa (Acacia koa), the ‘ulu (Artocarpus atilis), and the wiliwili (Erythrina sandwicensis) tres.. Once a surfer selected his tree, it would be dug from the ground and he would place fish in the hole as an offering to the gods. The shaper, much like today, would shape, stain, and ready the board for the surfer. There were three basic shapes; the ‘olo, the kiko’o, and the alaia. The ‘olo was thick in the middle and woujld get gradually thinner towards the rails. The kiko’o was longer, 12 to 18 feet and was difficult to maneuver, requiring great skill. The alaia board was about 9 feet long. It also required master skills to ride successfully. During the early 1800’s European missionaries to the Hawaiian Islands considered surfing “inmoral” and essentially banned it,, along with much of the rest of the Hawiian culture. Sadly, by the mid 1800’s surfing had almost disappeared and when it found new life around the turn of the century there were few Hawaiian surfers left.